The idea for this entry came to me while making my usual 11.5 mile ride in to work one morning a few weeks back. 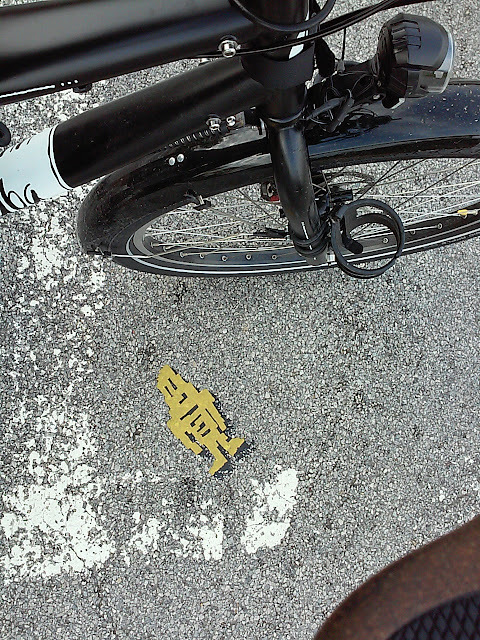 I crossed a street that subdivides part of the multi-user path that comprises approximately 98 percent of my ride. It had been a great morning. I started out a little late, leaving the house a few minutes after when I usually would. The threat of being late for work had me hammering on the pedals, even into a light headwind if I remember correctly. The Yuba Mundo is not a light bike by any stretch, but still I managed to keep it going at a fast clip. I'd hunker down a little, grab the forward portion of my Jones Loop bars to get a little more aero and I'd crank it up a notch. I'd settle down a little, sit up with my hands on the grips and dial it back a little. I get very few commuters riding bikes in the same direction (north), that I'm riding every morning. I pass a few runners and joggers, and very occasionally a slower cyclist. No. That morning it was just me and the clock. I made it to my usual halfway point and rolled past it with plenty of time to spare. I wasn't going to be late at all that morning. I had plenty of time to spare. I rolled across that bisecting street and looked down, seeing this little 8-bit robot-man ground into the pavement. I'd seen him days (weeks? ), before crossing that strip of pavement but didn't pay him much mind. Was he some child's toy, or a sticker, or what? I have no idea, but he's now permanently merged with the pavement, forever gazing upwards with a little wry, half-grin on his face. For whatever reason that morning, I thought about him for a few pedals strokes, then turned around to go back and take a picture. Somehow, he seemed like a metaphor for what the commute is some mornings. Some days the wind is in my face and I have to pedal just to keep from being blown backwards. Some days my legs just don't have the steam and it's a struggle to turn the cranks. I realized that on those days I'm like that little 8-bit robot-man, ground into the pavement. I know, it's a weird metaphor and I'm not sure it makes sense. But that particular morning, it seemed to make sense in light of the hell that was most of April, with headwinds and winter-like temperatures more mornings than not. That was me, ground into the pavement by the elements, just a wry little grin as I tried to keep the cranks turning over. Then, there were mornings like that one that I stopped to go back and take that pic of the little 8-bit robot-man. I had the headwind, but the legs were like pistons. I powered through and my tires soaked up bumps, and I sailed along, veritably hammering out the miles. 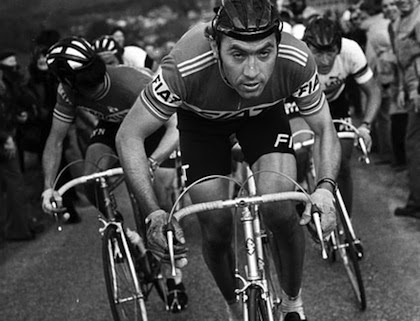 It's mornings like that when I feel like I'm channeling Eddy Merckx. My thighs are like massive pistons, turning the cranks. I eat the miles up. Ahead, I see another rider and I dig deep, closing the distance, then I pass them. I keep pushing harder. I relax for an instant, then I dig deeper still and I open up a lead. I open a lead on who? What? Maybe it's just a lead on the clock. I'm only challenging myself. I hammer the miles out on those mornings. I'm Eddy, not a little 8-bit robot-man ground into the pavement.